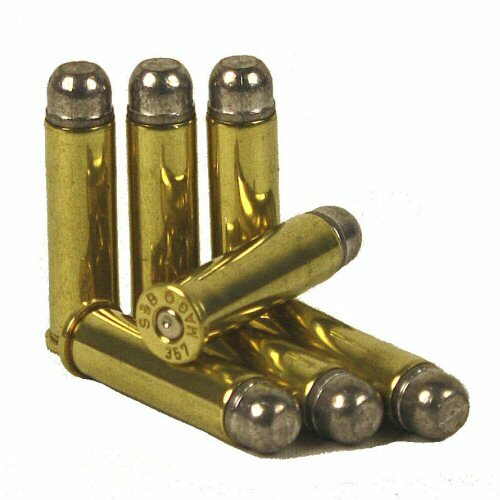 An inert and fully deactivated cartridge or round in 357 Magnum calibre. Also known as .357 Mag, 357 Magnum. This round is slightly thinner and slightly taller than the 38 Special, and can provide some extra power over the 38 Special. This calibre can be matched with many Smith and Wesson police revolvers, old West cowboy revolvers, lever action rifles such as the Winchester and Marlin. This cartridge has lead round nose (lead RN) heads or bullets. This is more authentic for cowboy or old West display since cartridges of this era were usually filled with gunpowder (black powder) with a lower expansion rate than modern smokeless powders. The .357 Magnum is still manufactured and used today. Please note, these inert cartridges are shipped with no powder and fired primers (indented). Warning, attempts to illegally re-activate will result in personal injury! Price is for one inert round only. Inert rounds shipped outside the UK may only be shipped by courier (eg UPS) due to civil aviation authority controls.